Years of experience have shown that there is a direct correlation between KCS understanding and KCS results. 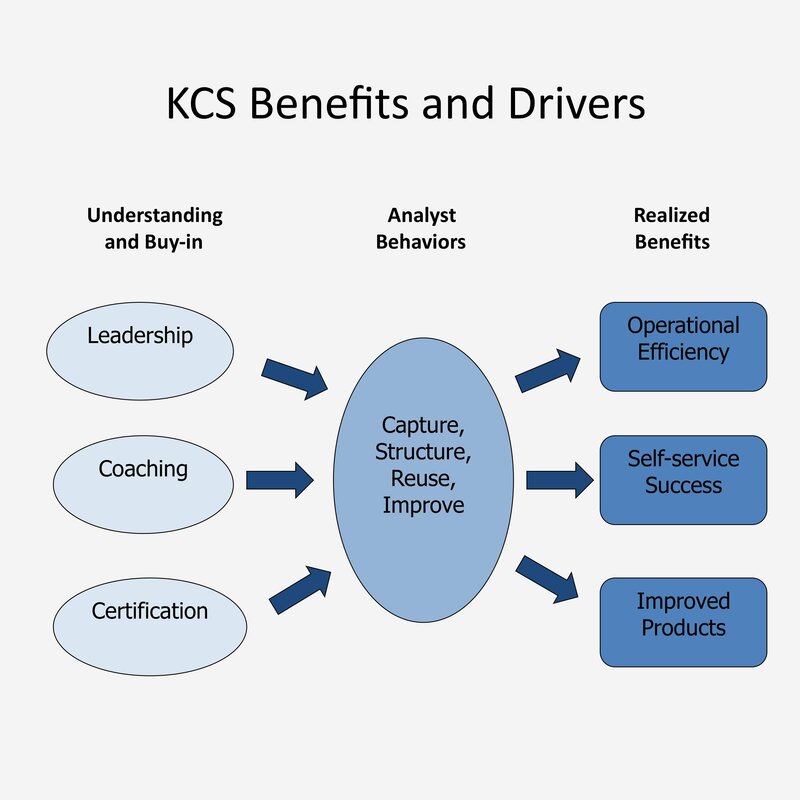 Use official KCS certification to strengthen your organization’s program and reap the benefits. 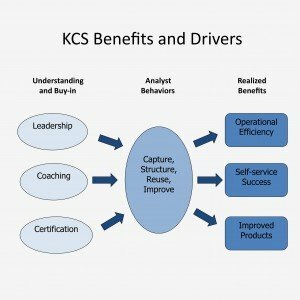 The degree to which people in your organization truly understand the KCS concepts – why it is important to the organization and what’s in it for them personally – relates directly to the degree to which the organization realizes the maximum benefits from doing KCS. Knowledge workers find articles about similar issues or situations that help solve new issues faster. Some self-service success resolves issues the customer would have opened an incident to resolve. Self-service success represents cost savings for the support provider, as the cost per resolution in self-service is dramatically less (1-2%) of an assisted call. Data from Consortium members show that customers will use an effective self-service model for ten times the number of questions that they are willing to contact a provider or open a case for. A successful self-service model leads to greater customer satisfaction. Patterns of article reuse (linking rates) can identify the top non-defect issues customers encounter. If linking rates and linking accuracy are high, we can quantify the impact of these issues from a financial and customer impact perspective, allowing us to provide actionable and compelling information to product management and development. Data from Consortium members indicates that for most product areas, three to five issues are the cause of 30-60% of the incident volume. Working with development to remove those issues results in a better customer experience and cost savings for the support center/organization. Maximum KCS benefit is created when knowledge workers change their behavior: when they integrate use of the knowledge base into their problem solving process. They are searching before solving, linking knowledge articles to incidents, and improving articles as they use them. They are creating new articles only if one doesn’t already exist. Lasting behavior change (and therefore long-term KCS benefit) results from knowledge worker understanding and buy-in, which are promoted by leadership, coaching, and certification. The benefits achieved are only as good as the weakest driver. 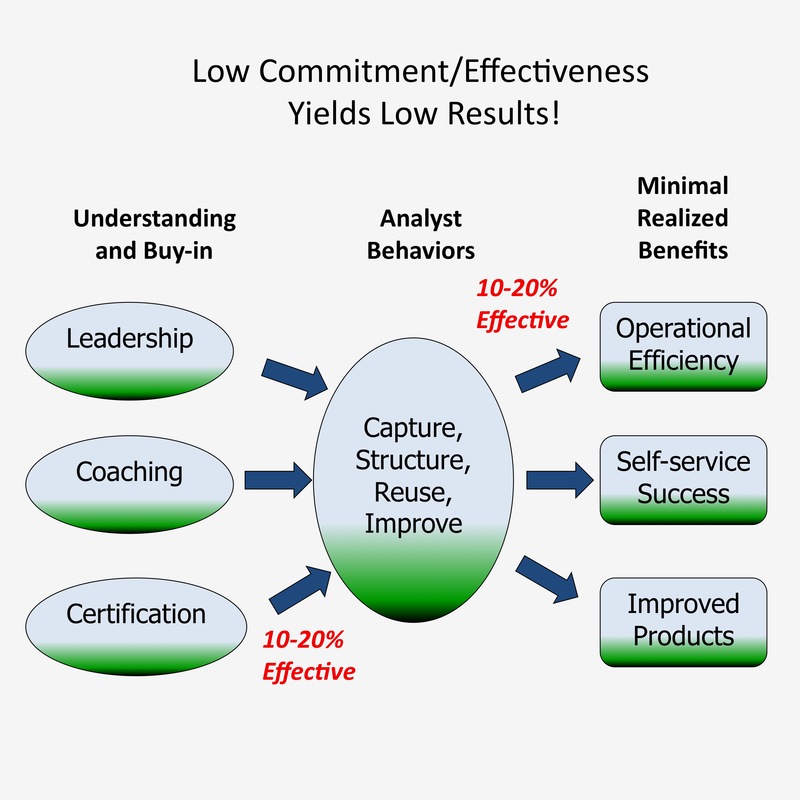 If, for example, Leadership and Coaching are strong but validation of the knowledge worker/analyst understanding is weak, the overall benefits achieved remain low. 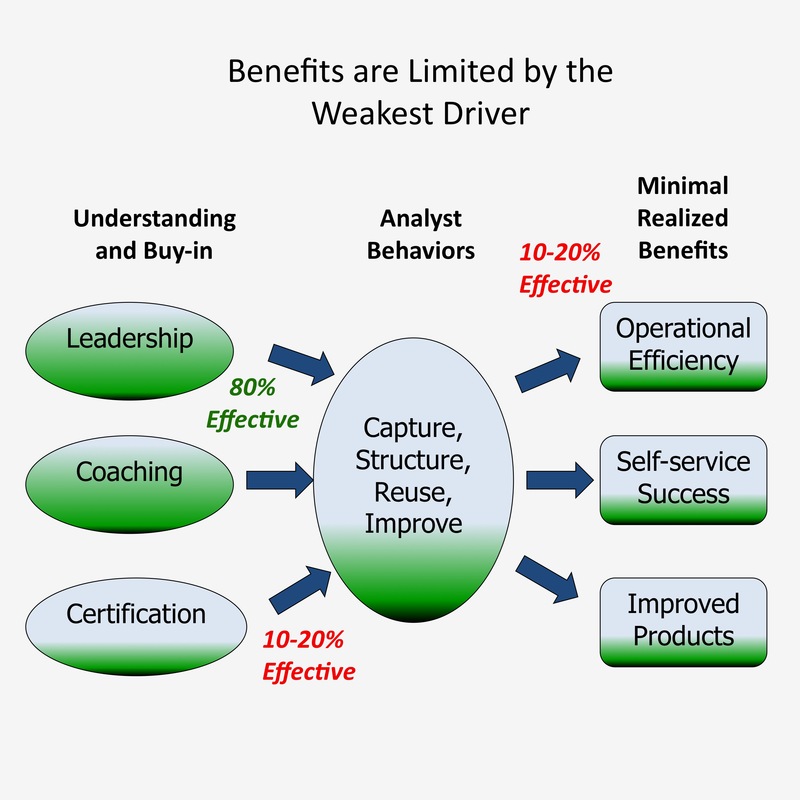 To gain maximum benefit, all three of the behavior drivers must be equally strong. The use of the KCS Certification Programs offered by the KCS Academy is an excellent way to promote understanding and buy-in. If you are just getting started with KCS, use of the Academy’s certification programs will accelerate your adoption by providing individuals with an incentive to engage. 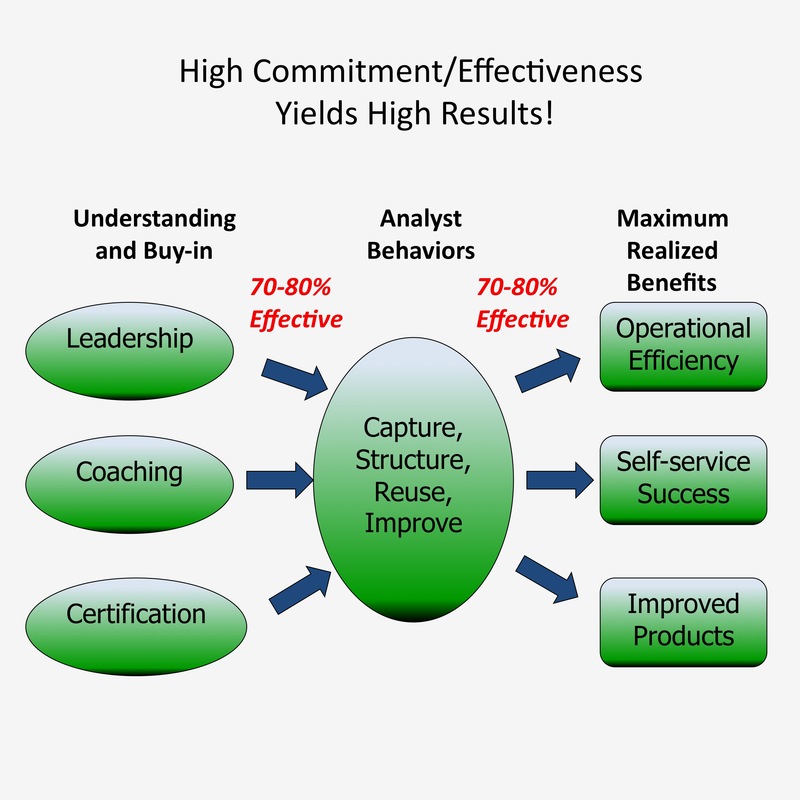 This helps ensure the organization sees maximum benefits quickly. If you have already adopted KCS, use of the certification programs can move the organization from lackluster engagement to fully committed Knowledge-Centered Service. Click here to learn which certification programs are right for you and your organization.